A spurtle is a Scottish cooking implement used for stirring porridge (oatmeal) and dates from at least the 15th century. It's design is ideal for constant stirring and thus preventing the porridge from congealing and forming unappetising lumps. It is recommended that you stir your porridge clockwise with your right hand - to stir counter-clockwise could invoke the Devil or bring bad luck. 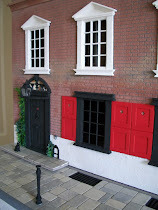 I picked up the mini spurtle on my trip to Miniatura and will be in The Tenement kitchen. The 1:1 spurtle will feature in The Tenement too but more of that later. Irene, I remember my best friend's mother (she was Scottish) telling me about spurtles. She also told me a recipe for skerlie (not sure of spelling here) where you fry onions then add oatmeal. Crikey I wouldn't want to invoke the Devil by stirring my porridge the wrong way! I might just try that tomorrow morning to see if Gregory Peck turns up in the kitchen with red eyes. It's great, the object and the explanation as well. I am always interested in traditions. I didn't know this one.